The Yoga Sutras of Patanjali: The Eight Limbs of Yoga — The Contemplative Life. Pantajali has already told the reader what will lead to the stilling of the mind – practice and dispassion. This, however, is not the end of the story for Pantanjali, and this schema is difficult to maintain for the entirety of the Sutras. The Yoga Sutras also contain a long section dealing with a more "active" form of Yoga – that of self-discipline, study, and dedication to the Lord – the practice of which will lead to an overcoming of obstacles (what Patanjali calls klesas) to the stilling of the mind. 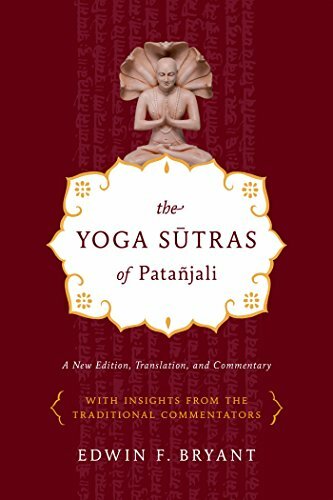 Finally, Patanjali presents his famous Eight Limbs of Yoga as yet another paradigm through which to view the Sutras. It is possible to fit the concepts of "practice and dispassion" loosely into the Eight Limbs, with dispassion overlapping with the first two limbs and practice overlapping with the last six. The Eight Limbs of Yoga, according to Patanjali, are abstentions, observances, posture, breath control, disengagement of the senses, concentration, meditation, and absorption. After introducing the Eight Limbs, Patanjali discusses each. Abstentions: The abstentions (listed in 2.30) are nonviolence, truthfulness, refrainment from stealing, celibacy, and renunciation of unnecessary possessions. Thus, the abstentions are things the yogi does not to. He refrains from violence towards any creature. He refrains from lying, stealing, engaging in sexual activity, and owning more than he needs. Observances: The observances (2.32) are cleanliness, contentment, austerity, study of Scripture, and devotion to God. Cleanliness includes both external cleanliness (eating a pure diet, perhaps ritual cleanliness practices, etc.) and internal cleanliness (keeping a clean conscience, etc.). Contentment is a commitment to being satisfied with the bare essentials of life. The yogi does not strive for more material goods than they absolutely need. Austerity includes the ability to maintain equanimity in the midst of hunger and thirst, heat and cold, etc. This may be developed by fasting or exposure to physically uncomfortable situations. The theistic nature of the Yoga Sutras is again apparent here as Patanjali recommends that all action should be dedicated to God (Isvara in this text). "Essentially, posture is a limb of the actual goal of yoga to the extent that it allows the meditator to sit firmly, sthira, and comfortably, sukha. Obviously one cannot fix one's attention onto something if one is sleeping or running about; one must sit, and sit without fidgeting or discomfort. In other words, asana's relevance and function for the classical Yoga tradition are to train the body so that it does not disturb or distract the mind of the yogi in any way when sitting in meditation." Breath Control: Yogic breathing, called pranayamah, is a specific form of breathing which is thought to help steady the mind. The mind is most often not focused on the breath in yogic meditation, but this type of breathing may help the yogi focus the mind on the object of meditation. Disengagement of the Senses: The next four limbs all surround mind states associated with meditative practice. Patanjali says little about the disengagement of the senses, but when the mind is focused one-pointedly on an object, the awareness of sensory input is limited, or perhaps disappears altogether. Thus the disengagement of the senses is a function and byproduct of concentrative meditation. Concentration: Concentration, according to Patanjali, is "fixing the mind in one place" (3.1). That is all Patanjali says about this limb in this section of the Sutras, although he has discussed concentrative meditation at length earlier in the work. The object of meditation can change for Patanjali, although he recommends meditation on Isvara (God) using the mystical symbol om above all other objects. Meditation: Meditation is not a separate practice from concentration, but rather a deepening of concentration. All Patanjali adds here (3.2) is that meditation is one-pointedness of mind on one image. Absorption: Finally, the ultimate stage of yoga is absorption, or samadhi. In this stage, the mind has merged with the object of meditation and there is no self-reflective thought (i.e. "I know I'm meditating."). Some commentators use the image of a clear crystal. When the crystal is put next to water it appears blue. When it is next to a rose it appears red. The mind is likewise absorbed and merged into the object of meditation to that there is no differentiation between the two. One can't help but be reminded of the Eightfold Noble Path of traditional Buddhism. Both "paths" contain an ethical dimension, an intellectual dimension (i.e. accepting a certain philosophical outlook on life), and a contemplative dimension (i.e. meditation practice(s)). Likewise, in both paths each limb is important. A yogi can't expect to make progress in meditation, for instance, while leading a dishonest life. Each aspect of the path reinforces the others. Again, the Eight Limbs of Yoga are one way that Patanjali presents his teaching, although it is probably the best known schema of his yogic system. The fact that Patanjali is simply passing on and synthesizing previous teachings from the yogic tradition becomes more apparent to me the more I engage with this text. The Sutras are less like a logically argued philosophical tract, and more like a loose collection of traditions which are here systematized in one way, and there systematized in another.